An elite pitcher for the Toronto Blue Jays and Philadelphia Phillies, Roy Halladay was of the top arms of the 2000s. As a first-ballot selection for the Hall of Fame, Roy Halladay rookie cards and autographs are seeing increased attention. 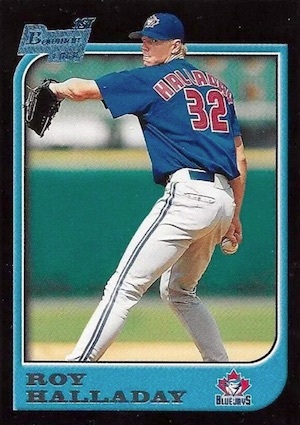 "Doc" Halladay's cardboard career began in 1995 when he was drafted in the first round by the Blue Jays. Minor league cards soon followed as did his first autograph card. See the Roy Halladay cards with the most bids on eBay. The Roy Halladay rookie cards emerged in 1997 with a handful of options. Also, many of his most popular autographs released at the end of the '90s. The eight-time All-Star is best remembered for his no-hitter during the 2010 postseason. He also pitched a perfect game that same season, netting him his second Cy Young Award. Halladay retired in 2013, but a tragic accident took his life in 2017. Bolded sets go directly to detailed product profiles and checklists when available. 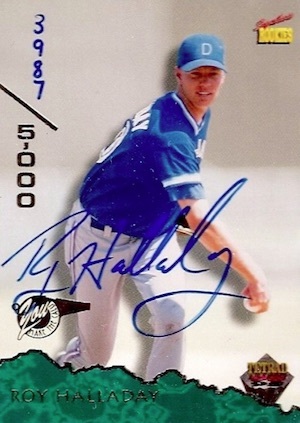 Showing Halladay with the Dunedin Blue Jays, the 1995 Signature Rookies card is not the most popular Roy Halladay autograph card, but it is the first. Hand-numbered to 5,000 copies, the minor league card is among his most affordable signature options. The base Halladay rookie card in 1997 Bowman Baseball is easy to find, remains inexpensive and is unlikely to see huge gains. If you are feeling patriotic, the International parallel adds an American flag to the background. On the other hand, the first Bowman autograph for Halladay can be very tough to track down. 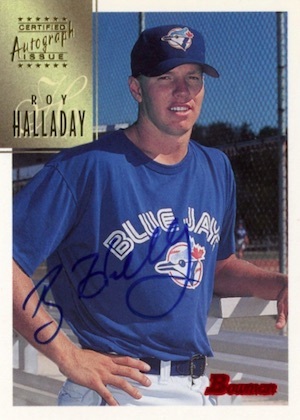 Also issued in 1997 Bowman, the on-card Roy Halladay Certified Autograph Issue card comes in black ink, blue ink and gold ink editions. The pitcher also has autographs in 1998 Bowman and 1999 Bowman. 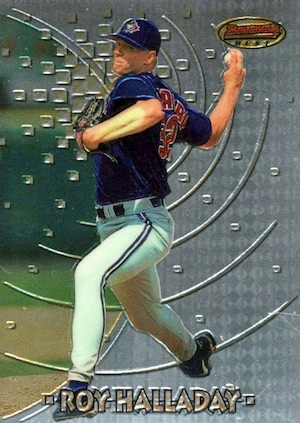 The key Roy Halladay rookie card is found in 1997 Bowman Chrome. Gem Mint base versions sell in the hundreds, and the International and Refractor parallels also enjoy strong interest. 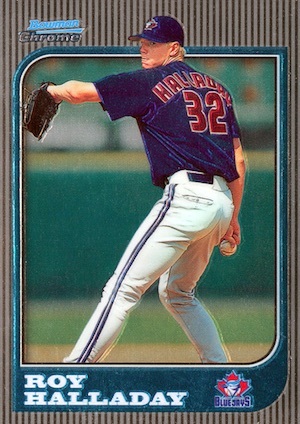 Chrome is not the only game in town, though, as 1997 Bowman's Best provides the third Roy Halladay rookie card. Refractor and Atomic Refractor parallels are the top options here. Roy Halladay autographs are sprinkled in various sets during his playing career, but he really doesn't have that many overall. One notable autograph is found in 1999 SP Signature Edition. The hard-signed card has a classic UD design and still sees a lot of attention. 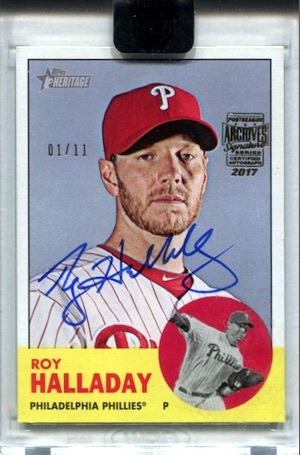 While 2017 Topps Archives Signature Series Postseason Edition is a buyback set, it does greatly boost the variety of on-card Roy Halladay autographs. All of these slabbed editions are unsigned base or inserts cards from previous Topps sets that have been hard-signed and serial numbered. At around $300 for a box containing one card, 2017 Topps Dynasty is not a cheap way to build a collection. Still, the Roy Halladay autograph patch is very impressive and there are six versions with different images. Each card is numbered to 10 copies with parallels limited to five and one apiece. But, to be honest, any authentic Roy Halladay autograph card is worth adding to your collection if you are so inclined.